In a world of limited resources, four different factions consumed by greed are competing for land. They've also managed to choose the worst possible setting in which to fight each other - a board of multi-level tiles that crumble into oblivion. Bad for them, but good for us, because the destructible land is a major part of what makes Greed Corp interesting. 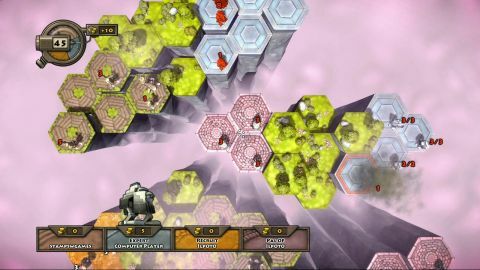 Greed Corp, recently released on Steam, is an accessible turn-based strategy game. Final Fantasy Tactics this isn’t: there's only one type of mobile unit (walkers) available to you. Use walkers to fight other walkers and conquer tiles. Build harvesters on the tiles to supplement the small allowance of gold given at the start of each turn. Tiles are anywhere from one to six layers deep, and at the beginning of each turn harvesters will pound down the surrounding area by one layer. Here's what makes Greed Corp interesting - harvesters cannot be removed (only self-destructed, which further damages the land) so while they can draw gold from the land, it won't be long before the surrounding area falls into the void. Matches that begin on 80-tile maps often end with you and your enemy hanging on to a small handful of tiles for dear life. Should there be no land left between your walkers and the enemy, you can build cannons on top of your walker-producing armories to wage war from a distance. You can also buy carriers capable of air-lifting up to 16 walkers to anywhere else on the map, though these are prohibitively expensive. As a result, a match can boil down to saving up gold in order to fly a walker into enemy territory and place a harvester in a most inconvenient spot. The conceptual simplicity of Greed Corp's battle system puts it somewhere between checkers and chess. Victory requires you to study the land, come up with a plan, and think many turns ahead. If you're too greedy and look only to harvest gold, you'll find yourself running out of real estate quickly. If you're too aggressive and send walkers out to conquer the landscape you may find yourself spread too thin to be a threat to anyone. It's this delicate balance between offense and defense that drives Greed Corp. The downside to this minimalist system is that there's no potential for expanding (or additional excitement, for that matter). There aren’t any new abilities to learn or new units to unlock - just additional maps and higher difficulty. Throughout the campaign you'll play as four different factions, but they differ only in appearance. Online multiplayer is there if you tire of the campaign, but win or lose, you can only play so much Greed Corp before you feel there's just nothing more to get out of it.